There had been cellars like this in the ghetto; almost all the buildings in Warsaw had them. I’d hidden in them often – to avoid the roundups and escape deportation – but never for days on end, and never alone. I didn’t know how long I’d have to stay there. Or how long I could survive on a daily potato and a little water. Miri’s life in Warsaw is simple but happy. She has loving family, and loves family holidays, and evenings when her father comes home from work and they are all together. But when the Germans invade Poland and reach Warsaw, life changes. First there are rules: Jews cannot be educated, Jews must not work, and, finally, all Jews must move to the ghetto.Life in the ghetto is a struggle, and, one by one, Miri sees her family either disappear or die. Finally, alone, she has a chance to survive when she is smuggled out of the ghetto. Based on true events, Within These Walls is a wrenching story of survival amidst the horrors of the Holocaust. Miri is eight years old at the start of the book and has a child-like view of the world, which changes as she ages and in line with the terrible things she experiences. The use of such a first person narrator makes the story very real. Miri’s character is, in part, based on the specific experiences of one child, and all events are based on things which really happened. Part of the My Holcaust Story series, Within These Walls makes this disturbing part of history accessible to children. Only this afternoon Papa had warned us of the German threat to Poland. Now the Luftwaffe’s bombs had succeeded in convincing us that everything was about to change. Hanna and her family have a happy life in Warsaw – until the Nazis invade, and the family must run and hide. Their crime? Being Jewish. Suddenly they have nothing, and every day becomes a fight for survival. First in hiding in the loft of a farmhouse, and later in the ghetto, Hanna must use all her skill to keep herself alive. 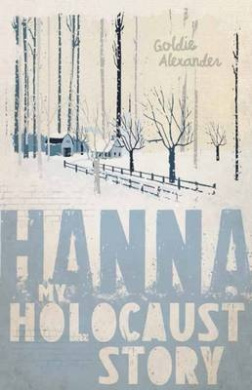 Hanna is a moving fictional account of one girl’s Holocaust story. Hanna is, at the start of the story, a fairly normal child: she has friends, is close to her family, and worries about things like missing out on gymnastics training. But as the Nazi occupation forces her family into a radically different life, she grows and discovers new talents and new strength. Hanna shares a terrible chapter in history with a young audience who may not be familiar with it, in a form which makes it accessible and movingly real.